We just saw the movie Vantage Point. We saw it in English with Spanish subtitles. As the movie takes place in Spain, it was interesting to see what they did with the subtitles when someone spoke Spanish. And, at 20 pesos each, the movie was a bargain. My brother keeps complaining that I am tardy in sending him pictures of the house we are renting. After having some problems with a camera and having bought a new one, I haven't any more excuses. Funny thing, though....we tried some batteries brought from the States in the old --- and allegedly broken --- camera and it works. This is our house. 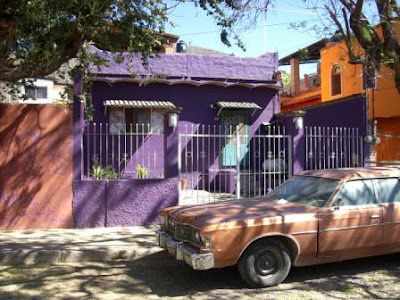 The property is very long and of course you can't tell that we have two bedrooms, two baths, a backyard, a mirador, and lots of space for our growing family. Do you see the mountain behind us?